SATURDAY, JULY 20, 2019, 9:00 A.M.–NOON and 2:00–4:00 P.M. Please email Emily McCauley to be placed on the wait list. The University of Mississippi Museum presents a two-day workshop with acclaimed artist, Laurin McCracken, in conjunction with his current exhibition, Visual Abundance: Realism in Watercolor. In this three-session workshop over the course of two days, participants will learn the basics of watercolor materials and technique. All levels of experience are welcome, and all materials will be provided. Pre-registration is required, as space is limited in this highly-anticipated workshop. His paintings have been included in multiple shows in China: Shanghai Zhujiajiao International Watercolor Biennial Exhibition 2010 & 2012, the Beijing International Art Biennale 2010; 2012 and 2015; the Shenzhen International Watercolor Biennial 2013 and 2015; and the Qingdao International Watercolour Salon, 2014. His paintings are included in the permanent collections of the National Museum of China; of the Asian Museum of Watercolor Art in Haikou City, Hainan Province, China; and The Watercolor Museum in Fabriano, Italy. 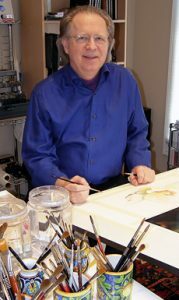 His work has been published in many national and international magazines and books including: Watercolor, Watercolor Artist, Artist’s, Drawing, American Artist, International Artist and Southwest Art. His work has been included in books such as Splash 9, 10, 11, 12, 13, 14, 15, 16; Strokes of Genius 2 & 3, Secrets of International Watercolor Masters, Volume #1 published in China, Masters of Realistic Imagery published in Germany and Masters of Watercolor published in St. Petersburg, Russia. His work is represented by Gallery 901, Santa Fe, NM; Southside Gallery, Oxford, MS; and Cassidy Bayou Gallery, Sumner, MS.